The Llugwy (locally pronounced "Ligoo") nestles a mile from the village of Llangunllo in the valley of the headwaters of the river Lugg which borders the property. Our 23-acre small holding is hedged by hundreds of mature trees, White Willow, Ash, Hazel, Oak and Sycamore providing secure, sheltered grazing. 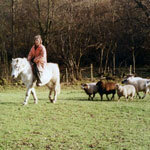 We can cater for guests travelling with their own horses and controlled dogs are welcome. Spring water supplies the entire property and each field has either a piped supply or a running stream for stock watering (our horses prefer the duck pond). There are magnificent views from the high fields and gated access to an off-road track leading to Glyndwr's Way and the hundreds of acres of hill common. The surrounding countryside provides breathtaking vistas and miles of walking or riding on droves and bridle ways across the hills and valleys. In this bird watcher's heaven you may often find that you share the landscape with no other living creatures but the soaring buzzards or, relaxing in the evening in true rural peace, watch the swallow's aerobatics as they hunt their evening meal. Guests who are unfamiliar with the countryside are reminded to bring appropriate outdoor clothing and footwear. City dwellers should also be aware that the owner's pet dogs are numbered among the livestock, also there is no mobile coverage in this part of Wales and wi-fi is unavailable. For those who prefer a little less peace and quiet, the historic border town of Knighton is 15 minutes drive away and Llandrindod Wells and Builth Wells are within easy reach on uncrowded roads. Motorcyclists are given a bikers welcome. Guests who prefer to use their own power for transport will find miles of walking right on our doorstep with "washpool falls" fifty metres from our gate, "Water Breaks it's Neck" falls half a mile away and the source of the Lugg a little further on. Glyndwr's Way passes just to the north of the farm and joins Offa's Dyke Path at Knighton. Further afield, Radnor Forest is a couple of miles to the South, and the coast of Cardigan Bay is only two hours scenic drive across the Cambrian Mountains. Visitors are free (subject to safety considerations) to explore the farm, help to feed or groom the donkeys, ponies and llamas, play with the friendly sheep and affectionate dogs and fly kites (or watch the real thing). Children, and interested adults, are welcome to assist in the day-to-day running of the farm (although The Llugwy tends to amble, rather than run). There are two riding establishments within twenty minutes drive offering trekking and tuition at all levels. Duck and hen eggs and home-made jam are available according to season. 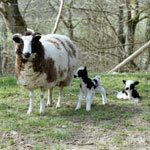 Accommodation, on a self-catering basis, is in a timber-panelled loft above the dairy. The "flat" has a 15' 6" X 15' 6" (4.72m X 4.72m) bed-sitting room furnished with a full size double bed and a sofa bed. A wood-burning stove makes everything snug for winter guests. For wet evenings there is a TV/video complete with a selection of films for your entertainment. A fully equipped kitchen/dining room, a modern bathroom and a two-bunk child's bedroom complete the accommodation. Linen and towels are supplied and a laundry facility is available. There are views of the countryside from every window. We do a "supply run" to Knighton every Friday morning and we will be happy to fill a supplied shopping list to ensure that the fridge/freezer is stocked on your arrival. Camping. We don't have a dedicated camp site but we'll always find room for a couple of tents and there is fresh water, toilet and shower facilities available. For those weary of nights under canvas there is the Radnorshire version of "glamping" (note the small g). We have a three (max) berth caravan with electric lights and gas cooking (no water) which offers shelter from the storm. We charge £5.00 per night, per person for tents which includes use of shower and toilet facilities and £5.00 per night, per animal for grazing horses and donkeys. The caravan is available for £20.00 per night which includes bed linen, towels, gas and electricity. Please give us some notice if you are interested and please, no unaccompanied teenagers. We're not hard to find. The farm gate is reached by crossing the river via an "Irish ford" from a small lane off the B4356. We're on the map, you'll find us, a little green house, on OS Landranger 148, grid reference SO185729. To check availability and make a provisional booking, please contact Wales Cottage Holidays on 01686 628200. We look forward to sharing the Llugwy dream.